The Shawnee are an Algonquian speaking people. They originally inhabited Pennsylvania, Virginia and Western Maryland. The origin of the Shawnee is unknown but according to one legend the Shawnee were the descendants of a war party sent by Chief Opechancanough ruler of the Powhatten Confederacy. They reportedly settled in the Shenandoah Valley in Virginia and are known for their widespread settlements. For this reason their language was used extensively for trade between many different tribes. This also enabled them to become leaders of Native American resistance to European and American westward expansion. Prior to 1754 the Shawnee had a tribal headquarters near present day Winchester, Virginia. After the battle on the Monongahela in 1755 most Shawnees chose to fight with the French in the French and Indian War. When the French lost the war many of the Shawnees joined in Pontiac’s Rebellion. To appease the Indians the British issued the Proclamation of 1763 that attempted to draw a boundary line between the English settlers and the Indians using the Allegheny Mountains as a buffer. The Treaty of Fort Stanwix in 1768 pushed the western boundary into present day Ohio and gave settlers territory in West Virginia and Kentucky that had been off limits. 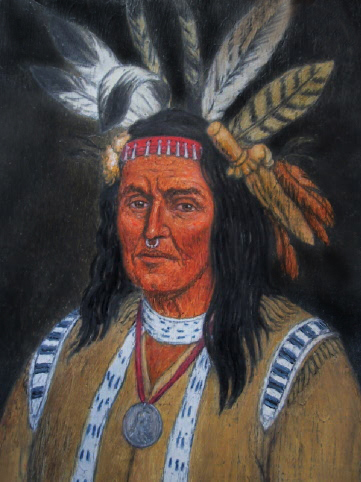 The Shawnee did not agree with the Treaty of Fort Stanwix because they had been excluded from negotiations. This Treaty failed to prevent a flood of new settlers pouring into Ohio. Violent incidents between settlers and the Shawnee would become Virginia Governor Lord Dunnmore’s excuse to begin a war in 1774 that was ultimately intended to establish Virginia’s claim to Western Pennsylvania and Eastern Ohio. When the American Revolution began in 1775 many of the Shawnee chiefs advocated joining the British in hopes of driving the colonists back across the Appalachian Mountains. On November 11, 1777 James Hall and a number of Virginia militia members attacked and killed the Shawnee Chief Cornstalk and two of his sons which reignited the frontier war for survival with both sides killing each other as fast as they were able. By 1780 violence was the only rule of law in Ohio. After the revolution the Shawnees created a Confederation of Native American tribes to continue to resist westward white settlement. The Shawnee were part of a force that General Anthony Wayne defeated at the Battle of Fallen Timbers in 1794. After this battle most of the Shawnee signed the Treaty of Greenville and migrated west to Missouri. As a result of ongoing conflict they were ultimately forced to move to Oklahoma where they reside today. © 2010 Smith Rebellion 1765 - If used for academic purposes please use proper citations.